There are times when our meals call for something lighter, something milder on the body. For those of us who are meat eaters, it's important to enjoy a few meals/days of meatless entrees. Let the internal system have some time of rest. The tricky part is will you be left hungry and wanting more after the meal? I think part of this is a mindset, so first set your mind right. You don't need meat with every meal- you just don't. Second, be sure the meatless meal you are making is hearty and flavorful. This cold soba salad covers the ask. 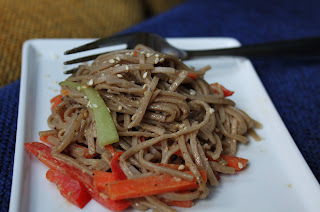 Soba noodles are from buckwheat flour - they resemble spaghetti noodles in size except that they are brown in color with a nuttier taste. 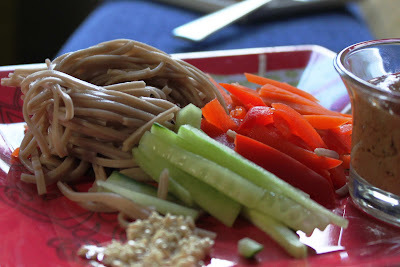 Since it is a Japanese noodle, it seems only fitting to mix this with a soy peanut sauce. The use of peanut butter helps to make this a 'stick-to-your-ribs' meal and offers protein to boot. The soba noodles themselves offer a great amount of protein as well. The veggies are interchangeable - throw in what you on hand or what is in season. 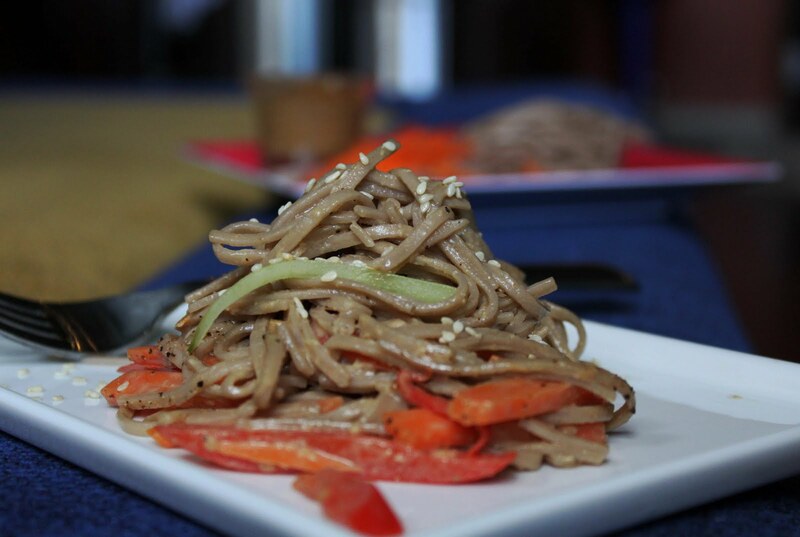 This dish can stand on it's own or serve with a light side salad tossed with an oriental dressing. You and your body will feel fat and happy! Tips and Techniques: Try creamy or crunch peanut butter, or get really crazy and use almond or even sunflower butter. Serve by tossing all the ingredients together and serve the sauce on the side. Make and serve the day of, the flavors do not deepen if left overnight. The flavors are best at room temperature rather than chilled. Begin by bringing 6 cups of water to a boil in a large pot While that is heating, chop the veggies- cut the carrots, cucumbers and red pepper into matchstick size pieces (long and thin). Add the soba noodles to the boiling water, cook until just before al-dente (refer to the package for timing.) Just before you drain the noodles, add the carrots and peppers to the boiling water ( I like adding the veggies to the water just to ease the crunchiness slightly.) Drain everything, rinse really well with cold water, set aside. Make the dressing next- add the oil, ginger, garlic and soy sauce to a small fry pan. Simmer for about 2 minutes just to help soften and release the flavors of the garlic and ginger. Turn off the heat and add the vinegar and peanut butter. Whisk together while drizzling in the hot water. Add just enough water to make the sauce thin enough to toss. Toss the sauce with the noodles, veggies and cucumbers. Top with toasted sesame seeds or crushed peanuts if desired. Serve.